Very poor digiscoped record shots of today’s rarities: Greater Flamingo and Asian Dowitcher. 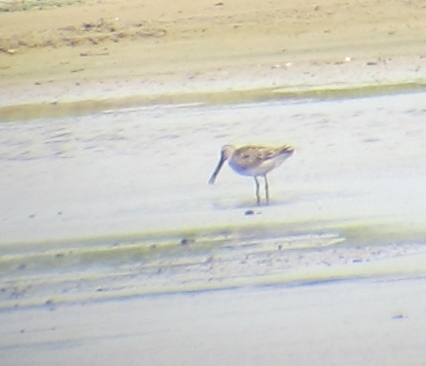 Despite being a tedious two-hour scooter drive from Kaohsiung, the Budai area keeps drawing me like a moth to a flame because of the excellent numbers of passage waders to be seen there. Naturally, on arrival I first headed to what seems to be the current prime location for flocks of shorebirds, pools beside Highway 17 at Km 134.5. It didn’t take long to find two Asian Dowitchers, my third and fourth self-found individuals of this species this year. They were loosely associating with about 10 Eastern Black-tailed Godwits. 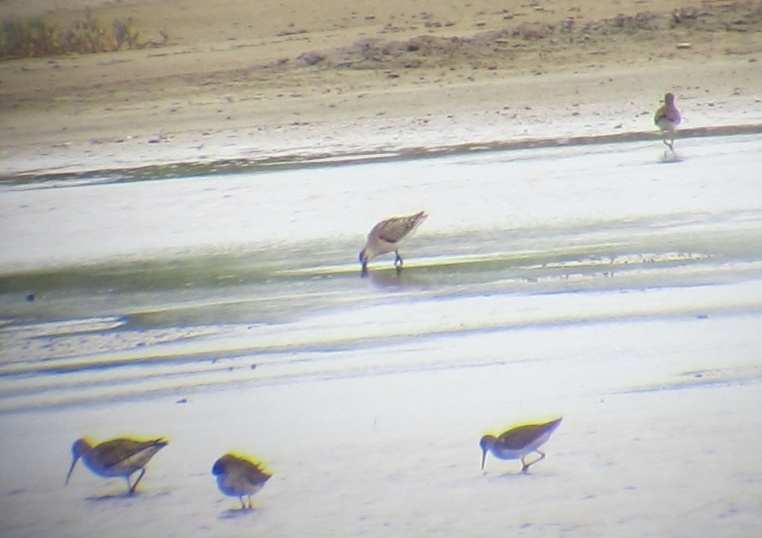 Taking photos with my Canon G12 held against the eyepiece of my scope produces barely passable record shots, plus the dowitchers were fairly distant and feeding constantly, and it took more than 30 attempts to even get a blurry shot of the closest bird with its head out of the water. The least bad of my various tries are shown above – my shots are not going to win any awards but at least the bird is identifiable. Next up, I spent several hours exploring back roads looking for suitable wader habitat. Unfortunately, the water levels at most pools are generally too high for waders at the moment. However, a wrong turning found me on the service road of Expressway 61, heading south, and at Km 276 I spotted some good-looking pools on the right hand side of the road. 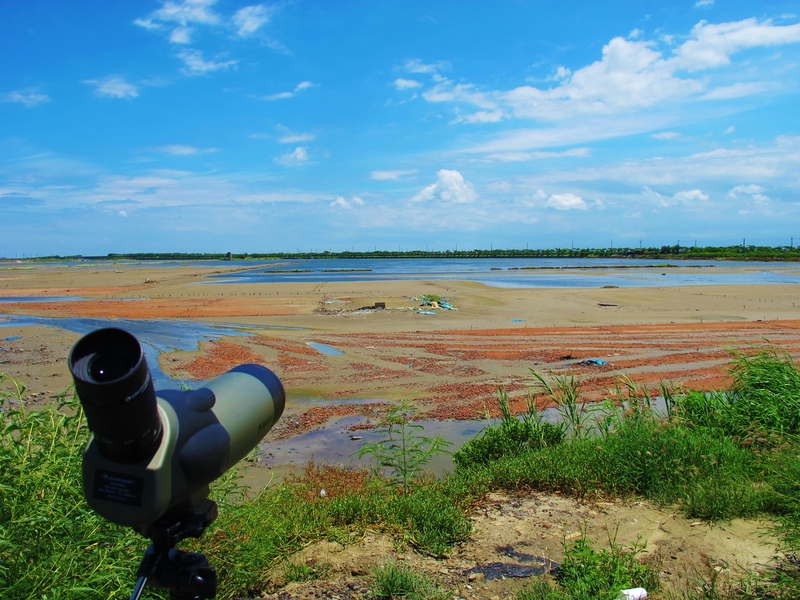 Birding at Budai’s “flamingo pools”, alongside Expressway 61 at Km 276. A quiet minor road runs alongside the pools, and I set up my scope here to look at the two very large, pink birds that I had first spotted from a great distance while driving alongside the Expressway. Sure enough, they were the long-staying Greater Flamingoes, which have apparently been in the area – though not always easy to find – for many months. The origin of these birds must surely be dubious at best, but they sported no rings and looked good feeding heads-down in authentic salt-pan habitat. My third and final productive spot was a farming area alongside Highway 17, between Km 146 and 147. Minor roads on both sides of the highway run alongside shallow pools with varying water levels, and drier rice paddies with sun-baked mud. Huge numbers of waders were here, including good numbers of the two passage waders I most associate with this type of habitat, Wood Sandpiper and Long-toed Stint. I didn’t have enough to time to painstakingly search through the flocks, but in future it will definitely be worth spending a couple of hours doing so. 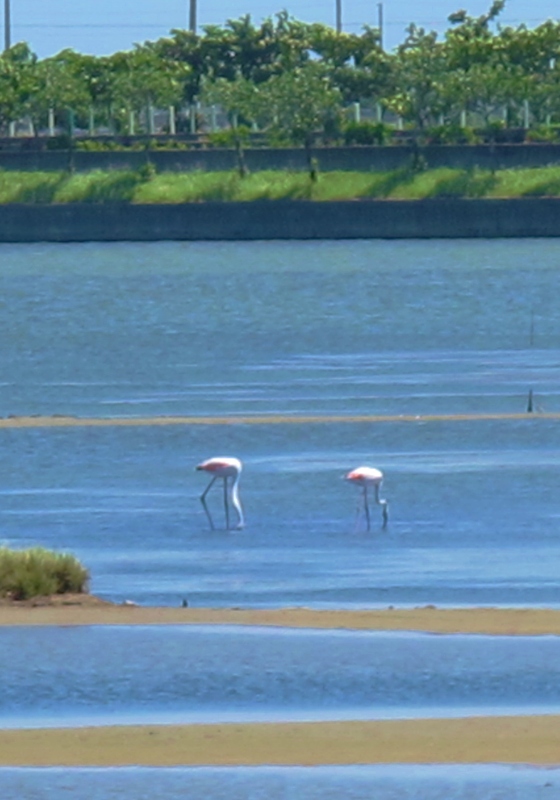 Taiwan tick: Greater Flamingo (total 241).